Reflections for Detective Michael David Davis, Jr.
Detective Michael David Davis, Jr. WILL NEVER be forgotten. May his soul rest peacefully in Heaven along side of his earthly father and Heavenly Father. May God provide peace in the hearts of the family of Detective Michael David Davis Jr., and may his soul rest in Heaven along side and with the soul of his father, Michael David Davis Sr. The monster who killed Detective Davis and Deputy Oliver will have to atone for his actions beyond that of in which our society can impose. All I can do is pray for the souls of Detective Michael Davis Jr., Deputy Danny Oliver, Investigator Michael Davis Sr. and each Law Enforcement Officer who lost their respective lives serving their communities; May their souls all rest in Heaven. A SALUTE TO BRAVE-HEARTS OF DAVIS FAMILY, DEPUTY MICHAEL DAVIS SR., AND HIS SON DETECTIVE MICHAEL DAVID DAVIS JR. THE FATHER AND SON BRAVE-HEARTS SACRIFICED THEIR LIVES, PROTECTING US FROM THE EVIL. THEIR SACRIFICE WILL BE REMEMBERED FOR TIMES IMMEMORIAL. SADDEST DAY FOR THE DAVJS FAMILY BECAUSE ON THIS DAY 26 YEARS EARLIER, DEPUTY DAVIS SR., SACRIFICED HIS LIFE IN A HELICOPTER CRASH IN A JOINT DRUG INTERDICTION ON OCTOBER 24, 1988. WE THE RECRUITS OF LASD ACADEMY CLASS 429 SALUTE THE DAVIS FAMILY! Rest In Peace Brother. We remember and honor you on the 3rd anniversary of your E.O.W. May God bless all of you, your father and all your family unbelievable!!. See you on the other side. Today, once again I thought of you as I tried to explain to people about the many problems within our world and in the US. I pray for your family, as I pray for mine who are in Law Enforcement. Tragic and ironic.... I will probably be telling people that the circumstances behind your death were needless... if this man had been dealt with by his country... he would not have been here to take your life. I don't know what the answer is, but I know you and many others were and are working to find the solutions. Not just in the police or sheriff's offices but also the social services, border patrol, public health and many many other concerned people going in to thankless jobs, to make the world a better place. Rest in Peace, until I meet you and your dad in the Clouds of Glory on Christs return. R.I.P. Investigator Davis, Prayers to his family, brother officers and friends. You come from a family that has not only served but made the ultimate sacrifice twice, Sadly. Thank you for your service, you will not be forgotten. Rest easy your brothers will take it from here. It was a year ago tomorrow that we fought together to stay alive. I think about you every day and how you didn't run, get scared, or do anything other than professionally execute your job. It was one of the bravest things I have ever witnessed. I want you to know I am doing my best to earn it. Every person I help from here on out is a person you helped too. That is how I choose to honor and remember you, and that is how I hope to continue the positive impact you had on the world. I am riding in the Texas Wheels of Justice, Hero Ride today and wearing Michael D. Davis Jr name on a bracelet in honor of him. I will be riding for him. Thank you for your service. Thoughts with family and friends as the one year anniversary approaches. Rest in Peace Investigator Michael Davis. Thank you for your service to this country and your community. My thoughts and prayers are with your family and your department at this time. My deepest condolences for the loved ones of Officer Davis. John 15:13 Greater love has no one than this, that he lay down his life for his friends. God Bless you. Rest in Peace. Thank you Investigator Davis for your service and sacrifice. I am so sorry to hear of this tragic loss. That is one of the saddest stories I have ever heard of, 26 years to the day his father was killed in the line of duty. God Bless his family as they have given too much. RIP Michael Sr and Michael Jr.
#PrayersandBlessings4 for the Immediate Family as well as the Department Family of this HERO Officer. Rest in peace brother, we have the watch now. One tragedy of this type is devastating. Two is not fathomable. 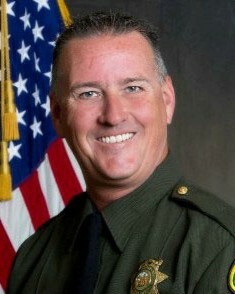 To the Davis family, and the entire Placer County Sheriff's Department, you have my deepest condolences. Support each other now and always. I did not know you personally, but as a future Peace Officer myself i consider you a brother. You are a true hero. Rest In Peace brother. God bless you Peace Officer. Thank you for reminding us all what a true hero is.